For those who appreciate the finer things in life, the Camden Dining Table is essential. 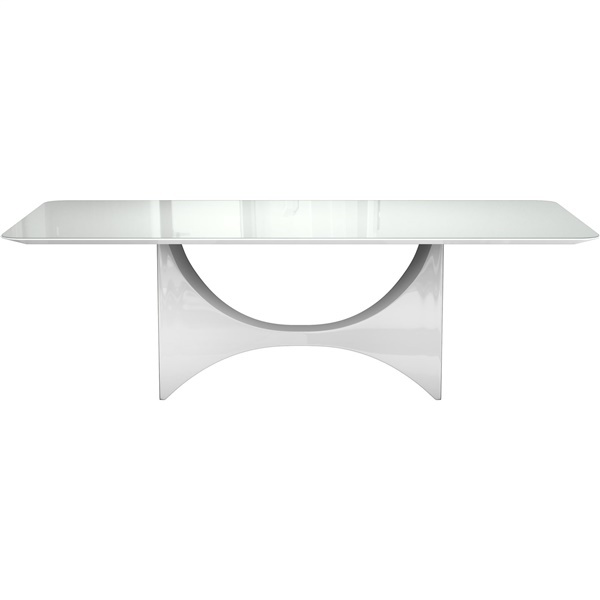 This sleek, sophisticated dining table boasts a chamfered glass top that offers space for up to 10 guests. It also boasts a dual-tapered, half-moon pedestal base with rounded corners to give the dining table a luxurious look and feel. Enjoy a top-of-the-line dining table that adds visual interest and organic appeal to a setting's d�cor � the Camden Dining Table. Dual-tapered, half-moon pedestal base with rounded corners brings a touch of glamour in a modern or traditional dining room. Chamfered glass top offers ample space for up to 10 guests. Natural wood veneer on the table's base adds visual interest and organic appeal to a dining room's d�cor. High-gloss lacquer on the table's underside will sparkle day after day. Composite wood construction guarantees amazing quality.